Each Chosen As National "Featured Facilities"
WHITE PLAINS, New York - The USTA has announced that four facilities from the Southwest were among the 13 winners selected in its 34th annual USTA Facility Awards Program, which recognizes excellence in the construction and/or renovation of tennis facilities throughout the country. 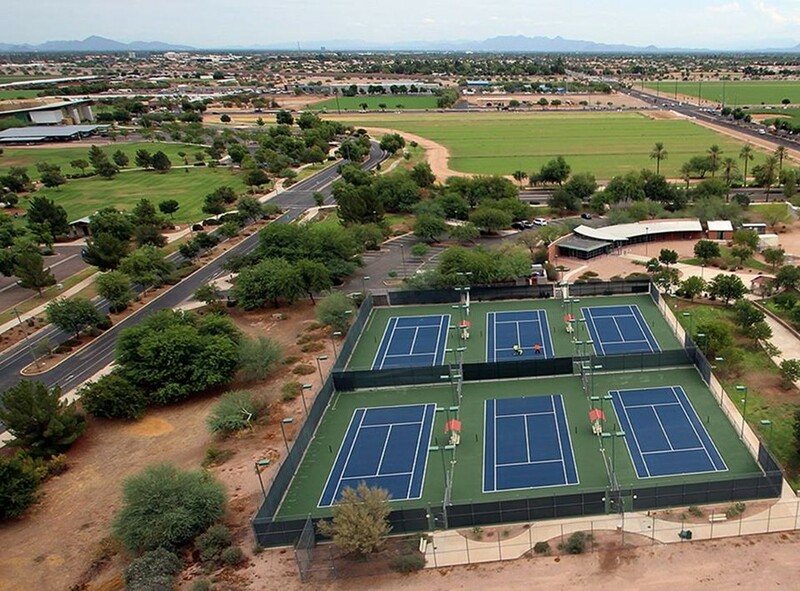 Chandler Tennis Center in Chandler (pictured - right), Ariz. These facilities will be honored at the USTA Semi-annual Meeting at the Grand Hyatt Hotel in New York City on Sept. 6. All four of these facilities have either been significantly upgraded or built from the ground up (McKinnon Family Tennis Center) within the last 18 months. 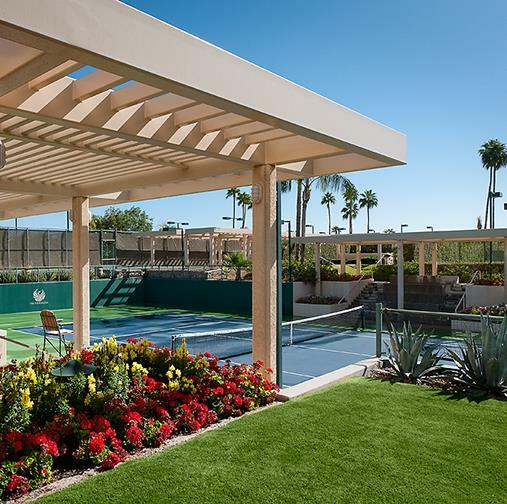 Both the Chandler Tennis Center and the Phoenix Tennis Center were lauded in the Public Tennis Center large court category (11 courts or more), while the Phoenician Resort was an award winner in the Private Courts category. The Chandler Tennis Center is located within Tumbleweed Park in southeast Chandler. The facility was built in 1996 and renovated in 2014 when the 15 asphalt courts were replaced with 15 post-tensioned concrete courts. In addition, tiered concrete seat walls were added to enhance spectator viewing and a large hitting wall was built. The hitting wall spans three courts and is one of the largest in the Southwest. Updated landscaping was also installed. 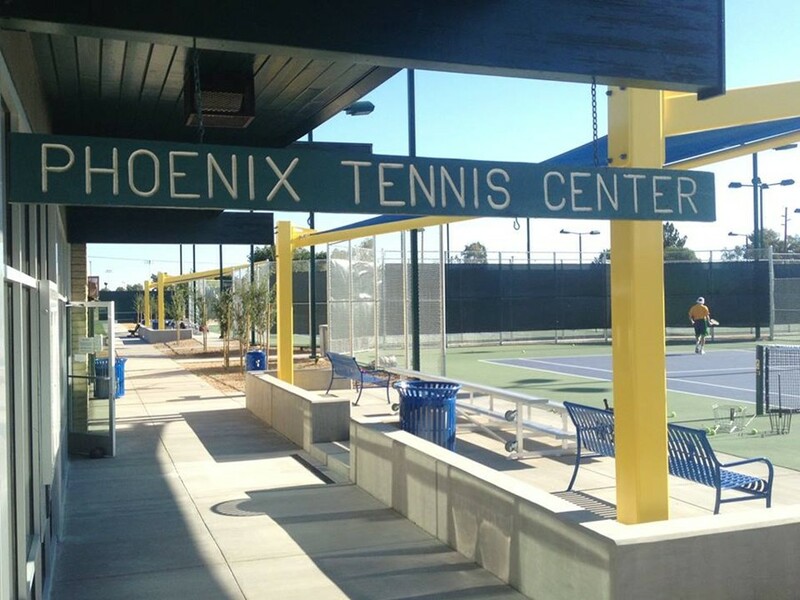 The Phoenix Tennis Center is centrally located and part of a larger campus of facilities at Washington Park that emphasize and encourage fitness for Phoenix residents. In partnership with the City of Phoenix, a recent renovation project included installation of 25 new state-of-the-art post tension courts, new lighting, shade canopies, fencing and landscaping as well as the installation of bleacher seating and new chilled drinking fountains. Recycled materials were used for construction of each court base and Phoenix Parks and Preserve Initiative funding was used for the renovation. This initiative was voted on by the voters of Phoenix that ensured that a small tax portion be used for the construction and operation of recreational areas in the city. Originally built in 1969, the center’s two-year renovation was completed in January 2015. The Phoenician Resort has 11 courts, including two Rebound Ace, one Plexicushion, and one grass court. The facility continues to grow annually, and now has seven full-time professionals and support staff working as a team to support a variety of energetic programs for the resort and local tennis community. Some of the programs include: a year-round junior academy, 10 and Under Tennis programs, league clinics, resort and local “live ball,” and private instruction. In addition, the facility hosts more than 20 Adult USTA and Regional league teams for match play, instructional programs, playoff, and championship events. The Phoenician Tennis Academy has hosted more than 80 junior participants in its weekly Performance Academy and Recreational programs which run year-round. The staff also contributes many hours to support local charity events such as Tennis with a Cause, Battle of the Sexes, and Breast Cancer charity fundraisers. The facility is also home to several USTA League teams and has been a past host of USTA League Championships and USTA adult and junior events. 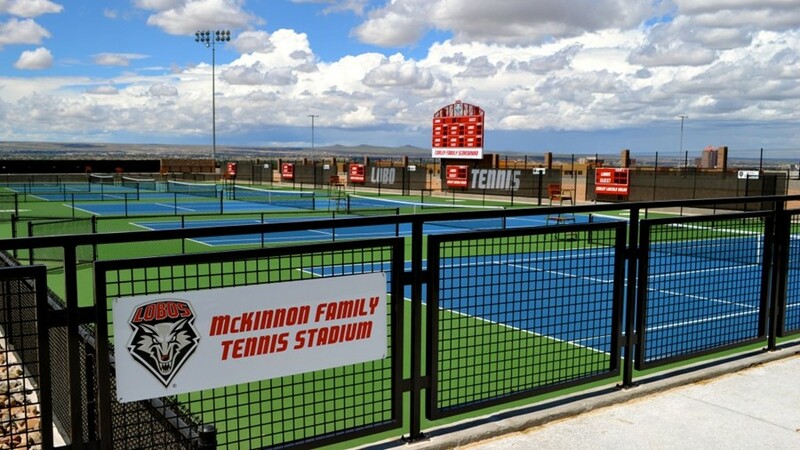 The McKinnon Family Tennis Stadium, located just south of the University of New Mexico campus and near the WisePies Arena (aka The Pit), adjoins the Lobo baseball and softball fields. McKinnon Family Tennis Stadium was the only facility in the nation honored in the Educational Institution category. The streaming infrastructure and park-like landscaping includes signature fencing, logoed court benches, black-out windscreens on the non-spectator side of the courts, generous space at the baseline, and easy access to parking, along with concessions, public restrooms, scoreboards, and sound system—all making the McKinnon Family Tennis Stadium an ideal place to play—and watch—matches. In addition, the stadium lighting allows the flexibility to schedule dual matches and tournaments. “Receiving this recognition is a tremendous honor for our program and for our facility. We are thankful for the vision of Ian and Sonnet McKinnon and so many others who participated in supporting this vision that has allowed us to build such a wonderful facility that will help grow the game of tennis. This is a Great recognition for a Amazing Team of Professionals we have here. Nothing worthwhile in life is easy, but when you do it with great love and great people the ride is worth it. Cheers to our team and our great partners at USTA Central Arizona and USTA Southwest." 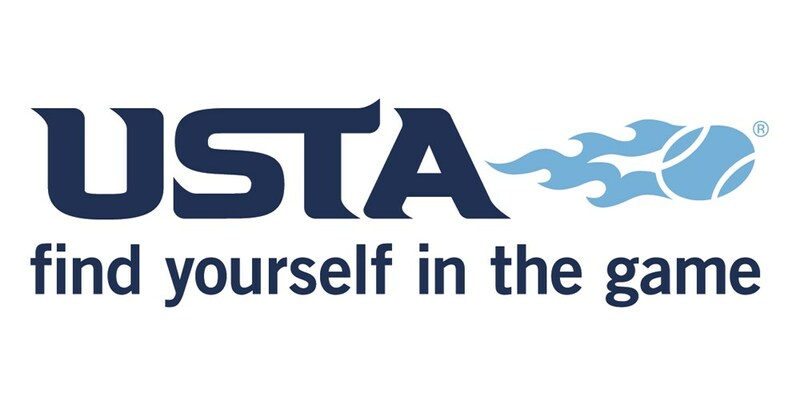 To be considered for an award, facilities must be under the jurisdiction of a parks and recreation department, an educational institution, a non-profit corporation, or be a private or commercially owned and operated facility that offer both USTA and public programming designed to help grow tennis. Nominated facilities were voted upon in the following categories: Public Courts that are either small tennis centers with 2-10 courts or large tennis centers with 11 or more courts; Educational Institutions; and Private Facilities that support the USTA and other “growth of the game” programs open to the public. All 2015 award winners will receive a wall plaque and an all-weather sign, which can be mounted at the facility. Certificates of award will be made available to park and recreation departments, schools, and those professionals responsible for the design, construction, and maintenance of the facility. In addition, a one-year complimentary membership to the USTA will be awarded to each winning facility. Reed Sweatt Family Tennis Center – Minneapolis, Minn.
Princeton Racquet Club – Princeton, N.J.
Chandler Tennis Center – Chandler, Ariz.
Southside Tennis Complex – Jacksonville, Fla.
McKinnon Family Tennis Stadium – Albuquerque, N.M. Horseshoe Bend Country Club – Roswell, Ga.
Moss Creek Tennis Center – Hilton Head Island, S.C. The Phoenician Resort – Scottsdale, Ariz.
West Winds Tennis Center – New Market, Md. Trump National Golf Club – Potomac Falls, Va.